No, but seriously. At first you are like haha, that's funny, let's listen to it, because it is soo 1980s but asian (plus – or rather therefore – adorable as hell), and ‘that is so ironic’, but then you listen to it for the second time, because it's still funny, and then you listen to it for the third time, because you still feel the need to give it another go purely in the name of irony of course, and then you won't stop listening to it. 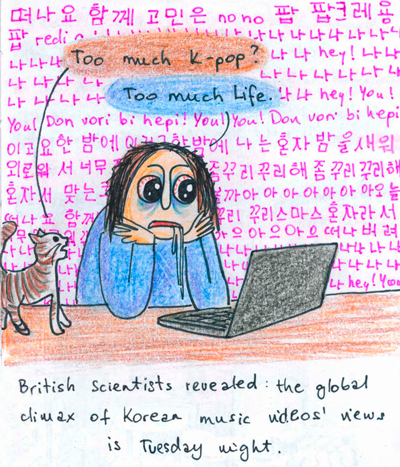 – Túl sok koreai pop? Brit tudósok megállapították: a koreai videoklip megtekintések kedd esténként tetőznek.